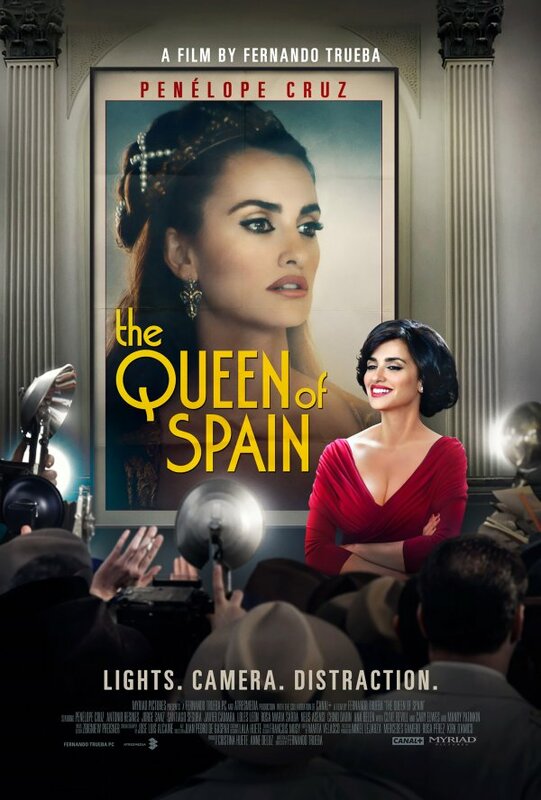 A mix of cinematic nostalgia, farcical comedy, and political intrigue, Fernando Trueba’s THE QUEEN OF SPAIN never really congeals into a satisfying whole. The main plot concerns glamorous Spanish actress Macarena Granada (Penelope Cruz) returning to her home country after becoming a star in America only to find that her presumed dead lover Blas Fontiveros (Antonio Resines) is alive. Blas gets a job on the film Macarena is starring in, a biopic about Spain’s Queen Isabella, but quickly runs afoul of his ex-wife’s new beau, an officer in the Franco regime. Blas is sent off to do hard labor, and at the urging of his ex-wife, Macarena goes to visit him. As it becomes increasingly apparent that someone wants Blas not just imprisoned, but dead, Macarena hatches a plot with the cast and crew of the film to help Blas escape. Around this main storyline, various other minor diversions swirl and intersect. Macarena falls for a young head grip (Chino Darin), the film’s prestigious director (Clive Revill) turns out to be a washed up drunk, forcing the uncredited screenwriter (Mandy Patinkin) to take over, and various cast and crew members engage in romantic escapades. There are pleasures to be found in QUEEN OF SPAIN. Ms. Cruz exudes considerable charisma and star power in her role. Film buffs will likely enjoy some of the behind the scenes minutiae. And given that the dictatorial Franco regime has to some degree faded from memory, and the fact that Spanish filmmakers couldn't exactly comment directly on it during his reign, this makes for a useful historical document and reminder. Unfortunately, Trueba tries to pack way too much into his film, to the point that the focus gets lost at times, and the main story never really grabs hold. It bears mentioning that this is a sequel to Trueba’s 1999 film THE GIRL OF YOUR DREAMS, a highly regarded film which this reviewer has not seen. For what it’s worth, at least it never feels as if one is lost not having seen the prior work. That said, if you saw and enjoyed DREAMS and wondered what the characters got up to next, you might get a little more out of this follow-up. On it’s own terms, it’s merely okay. 2 out of 4 stars.